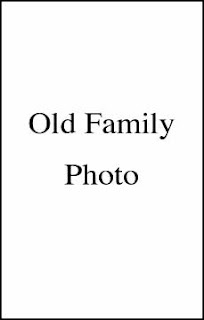 I have a terrific family photograph I'd like to share with you. It's non-PC Americana and rather unique. I don't know who holds the copyright or if the photograph is in the public domain. I am not certain as to when the photograph was taken or who took it. Conventional genealogical wisdom would hold this is a questionable photograph and I should show you another. But I love this photograph, I want you to see it, and there isn't another one like it in our family. So what am I to do? I've given it a lot of thought and I invite you to join me in my thought process as I make a decision (legal - moral - common sense) to post or not to post. -- It was given to me by my husband's family. -- It is a photograph of my father-in-law with his twin brother. -- It was a trip to Yellowstone with my father-in-law's parents and grandparents. -- There is a license plate visible in the photo. Dark color with light lettering. One large number 9 is visible. -- A fire danger sign is visible in the background. -- It is not a studio or professional photograph, it is an early 1900's snapshot. -- It is a black and white photograph. -- My father-in-law's parents, grandparents, and twin are dead. -- The photo was taken by one of the parents or grandparents. -- As the twins were born in 1918, they appear to be 5-12 years old in the photo. -- The license plate is a Montana plate for the year 1926. An internet search of all the Montana license plates for the 1900s returned only one that is dark in color with similar light lettering. That is the 1926 Montana License plate. It does not look exactly like the plate in my photograph, so the plate could be from another state, or there could be variations for the year. For the sake of argument I am going to assume the plate is for the year 1926. This would make the twins 8 years old which matches my earlier assumption. Note: Trust me, I will not be attempting to recite, teach, explain or interpret Intellectual Property Law. It is far too difficult to explain the law of Intellectual Property in one page or less, so I'll leave it to the lawyers. Intellectual Property Law is a legal specialty, takes years of study, should be left to attorneys in that specialty, and shouldn’t be attempted without a net. I will only be attaching some legal significance, as I understand it, to my photograph for the sake of discussion. When it comes to Intellectual Property Law, I know enough to know I don't know it all. -- Published or unpublished. I don't know if my husband's family sold any copies of this photograph. They have sold photographs before for commercial use. I will have to check registered copyrights to determine whether my father-in-law's parents or grandparents registered this photograph. If they didn't - it's in the public domain. Registration is required before filing suit for copyright infringement. Still need to determine the copyright holder, still need to determine if its registered. My father-in-law's grandparents died before 1937. If one of them took the photograph it is in the public domain. My father-in-law's parents died after 1937. If one of them took the photograph it is not in the public domain unless it meets some of the other criteria. Unpublished works when the death date of the author is not known - 120 years from date of creation. Works created before 1887 are in the public domain as of 1 January 2007. The photograph was not taken before 1887, so if the photographer turns out to be unknown it is not in the public domain. Now what? How confusing! Do I hire an attorney? As a Scot, I consider hiring an attorney in this specific instance to be a waste of precious money I could be spending on genealogical research. The opinion of an attorney is neither free nor cheap. Every day in every courtroom in this country there are two attorneys' opinions being argued. The court will determine that one of them is correct and one of them is not. So which opinion will I have gotten and what legal protection does it afford me? If I consult an attorney, what I have received is a professional opinion based on the fact that my attorney has been educated in intellectual property law, can find the correct law and interpret it for me. Having that opinion does not protect me from being sued. It is only an opinion; it is not a get out of being sued free card. The decision to post or not post is still mine. Only the court's opinion matters and that is until they are overturned. I have found no court case that expressly holds I can not post this photo based on a similar set of facts and circumstances. So in the absence of a court case, do I need a legal opinion or will good old fashioned common sense suffice? My family and my husband’s family took photographs for the purpose of sharing those images with other family members. This photograph was taken to commemorate a three generation family holiday and was shared with family members of the time. As the family historian, our families send me photographs along with the stories that surround them and encourage me to share them. I believe I have a moral duty to share so that those depicted in the photograph will not be forgotten. I have a familial connection to this photograph. I am not some person who is unknown to my family, publishing a book for financial gain, containing this photograph of my father-in-law, and publishing without permission of the copyright holder. I have not plucked this photo from the internet. So, Who Would Or Would Not Sue Me? Only the copyright holder, not some heretofore-unknown disinterested entity, has standing to sue me for copyright infringement. There are no Copyright Police patrolling the blogs looking specifically for my father-in-law's photo to sue me for a determination as to whether it is copyrighted or in the public domain. Under these circumstances the copyright holder will most likely be one of my husband's family members, if there is a copyright holder. If there is anything I know for certain in this Intellectual Property quagmire it is that not one single member of my husband's family will sue me for copyright infringement. That's just plain common sense. They would not spend the time and money to prevent me from posting a photograph that originally came from them with a mandate to share. So without a definitive determination as to whether this photograph is copyrighted or in the public domain, I have determined that my liability for suit under copyright infringement for posting the photograph of my father-in-law on my blog is slim to none. So what is my decision? Common Sense Wins - I will post! The photograph and its story will be available in my Monday post. I hope you will enjoy it as much as I do. I convict you of the heinous crime of common sense. How dare you! Quick! Stone her! She is a dangerous thinker! Seriously, thanks for the well thought out post. While I do not support stealing another's work for whatever reason, there is in my mind an important difference here. Would the creator of the work be damaged by the use? If they would have been able to sell the work and your use deprived them of that right then there is a moral problem. In my mind this is the standard I'm comfortable with. From a practical standpoint there is the "What are the odds they would find out and be able to do anything about it?" standard. Many would use this standard. I see this everyday in business. I guess we all need to determine for ourselves what standard we are comfortable with. Thanks again for your well written and thought out discussion. Just to make it clear, I am in no way giving legal advice. This is just the view of one man. Thanks for not giving legal advice and for agreeing with me. I am comfortable with this as well and would never condone pinching a photo from the internet. I really expected to be stoned by an attorney for not using an attorney, though. If someone were to see that photograph (or, for that matter any other photograph posted on the web or published elsewhere) and decide that you had infringed upon their copyright, wouldn't they have to prove in some way that they were in fact the holder of the copyright, i.e. they would have had to have registerd the photogaph? If you decide to register a copyright how do you "prove" that you have the legal right to do so? I wholeheartedly agree with your decision and am looking forward to your post! Common sense must prevail when it comes to the posting of photographs or anything that you personally have not created. Otherwise, how can we share without legal liability? All the issues you have brought up are so relevant. The law regarding copyright is very difficult to understand. I can't give legal advice but will direct you to a Copyright Primer at this site where they have done a good job of explaining many of the issues: http://www.tbr.state.tn.us/general_counsel/copyright/copyright.htm. It has been said that, anybody can sue anyone for anything. Winning is another matter. We family historians, genealogists, and genea-bloggers have a lot to consider. town. And I've never seen this photo anywhere else. What are the ramifications of publiushing it on my blog if I cite my source? First the disclaimer – I am not licensed to practice law, I cannot give legal advice. My family and friends believe I have some common sense. I can’t tell you the ramifications; I will suggest that first you do a common sense analysis as I did above. Here is something I read in researching my post. Citing the source is not a bar to a suit for copyright infringement. Does it have a copyright notice (you know it’s copyright date so I’m assuming it does)? Cornel University’s web site on copyright says works published in the United States from 1923 through 1977 that are published without a copyright notice are in the public domain. It’s linked in my post. Who would sue you? Here not a family member, as in my case, but a town. A town that most probably receives financial gain from the sale of the book on its history, not to mention it has incurred publishing costs. You probably don’t have a close personal relationship with the town, do you (not family), so aren’t they more likely to sue? No close personal relationship and they’ve published for financial gain and incurred costs. Common sense would say the path of least resistance would be to contact the town and request their permission to post. Suggest to the town that you will also post all information on the book and where people can buy it. Does the town history list its photographs and illustrations in the book? If so, you could contact the source of the photograph. If it doesn’t, ask the town for the contact information for the source of the photograph. Here is the thing I find most interesting. You’ve never seen this photograph before. If you’ve never seen it before who knows what other information or photographs the source may hold. I would be itching to get to the source. O.K. Bill – your liability, your call. Sorry I could not be more help. In the realm of Intellectual Property Law any advice beyond common sense belongs to the lawyers. Unfortunately the book is now 34 years old and the town is a very small one in Maine. There's no index or listing of photo contributors,just a sentence in the acknowledgment thanking those who had contributed material from old scrapbooks or photo albums. You raise some interesting questions, and provide some common sense answers.. kudos. This entire discussion is nothing but questions. Some that I think have no answers but common sense.